A lot of people ask about spamming through walls, wallbanging or sometimes they even call it walling. Today im gonna discuss about this. So what is spamming or wallbanging? Wallbanging is when you try to kill your enemy through walls ( or doors,boxes etc) i.e. you kill your enemy without looking at him. For this all you need is a good quality headphones so that you can hear your enemy's footsteps clearly, or if they open or closes a door, or they pick up some weapon or bomb and therefore you can shoot them through wall by their expected position. 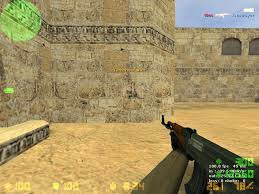 This is the most common spamming point in de_dust2 as a T to kill CT at Along. Here you have to stand next to the wall and hit a particular point on the wall between Along doors. There are many spamming points like this for all maps. If you are interested in these spamming points i can post for you. Now i'll show you a perfect example of wallbang in an international match. EG.n0thing vs redCode, he took out whole T team with wallbang.